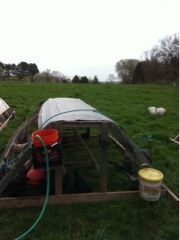 The laying hen pens were across the back of the farm, between the hoop house and the woods, all winter. That area still has more pricker bushes than we would like and we know those girls had a powerful impact on other parts of the property. They have greatly reduced poison ivy, ticks and prickly things in most of our paddocks! Today every pen is turned to head in the direction of the front of the farm. This long run, from the path by the woods up to the road, will take at least 90 days. It will be July before we turn their pens again. The fields are getting green. Cattle struggle to keep up with the growth!